We had our final inspection yesterday and passed with flying colors – even got a few compliments on how well we did things. 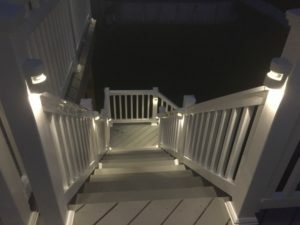 We’re still doing some last minute cosmetic cleanup before it’s completely done, but that includes things like painting over where the temporary railing was across the sliding glass door, attaching the post-caps to the post covers, and installing the LED lights on the Sunsetter. We’re working on arranging our furniture on it, as it’s smaller than our deck was in Virginia, but we still have the same furniture. I will be buying a new dining table though, as the one we have will not survive the winter winds here. I’m waiting for the one we want to go on sale “out of season”. The fancy lights are from Dekor, their Holly rail light in white, and their pyramid post caps. The Sunsetter is the largest one available, and it’s quite nice – has all the bells and whistles. The pattern isn’t my favorite, but it’s growing on me. Because we have blues and grays on the house, Sunsetter only had three colors that would “go”, and the other two were midnight blue and charcoal. 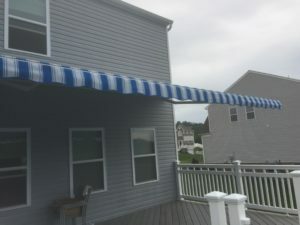 Since we’re going with this to provide shade, to keep cool, the darker colors weren’t acceptable to us, so we ended up with “Sky blue” (aka French Bistro as our friends refer to it). Where I’m standing to take this picture is the direction afternoon sun comes into the house. We have the Sunsetter weather breakers to provide more vertical shading. I’m looking forward to having my weekends back – just in time for our exchange student to arrive! This entry was posted in Home on August 10, 2017 by Mom.